Oracle CEO Larry Ellison can’t seem to stop himself from opining on Hewlett-Packard’s management moves. This time Ellison publicly derided HP’s hiring of Leo Apotheker, former SAP CEO, to take the top job at HP. Once again, Ellison’scritique took the form of a letter emailed to a publication–The Wall Street Journal. HP clearly had not solicited his opinion and did not comment on the Wall Street Journal blog. “HP had several good internal candidates…but instead they pick a guy who was recently fired because he did such a bad job of running SAP,” Ellison wrote. In fact, many HP watchers had hoped the company would draw from its bench–picking Todd Bradley, Ann Livermore, or Dave Donatelli to be its next CEO. Instead it opted for Apotheker, who spent more than 20 years at SAP and was ousted last year after SAP struggled for credibility in the SaaS realm and had launched and rescinded a support price hike on its software. 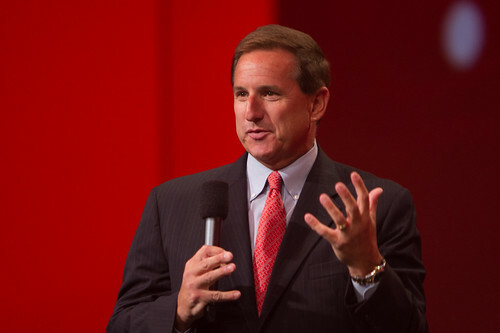 But, Apotheker does bring HP years of enterprise software experience just as former HP CEO Mark Hurd brings Oracle much-needed hardware expertise. Let us know what you think about the story; email Barbara Darrow, Senior News Director, at bdarrow@techtarget.com, or follow us on twitter. So, Leo Apotheker, former CEO of SAP will, as of November 1, be CEO of Hewlett-Packard. 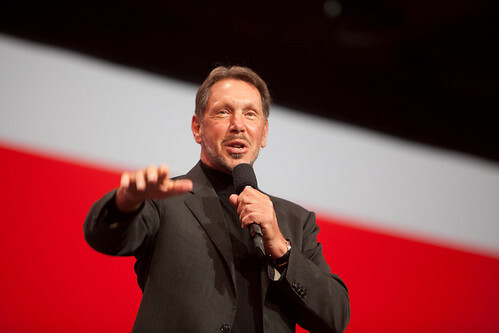 In 2009, Oracle CEO Larry Ellison compared cloud computing hype to water vapor. One year later he’s on the cloud bandwagon, especially if you’re interested in creating your own private cloud with Oracle’s new Exalogic mega box. Compare Larry’s Cloud commentary from ’09 to this year’s Oracle Open World Keynote. Check out all of our Oracle Open World coverage. IT management software company SolarWinds recently rolled out a new disaster recovery option for admins for the monitoring of Orion servers – the Orion Failover Engine (FoE). In the event of server network interruptions, the FoE provides a two-minute failover to a remote server to ensure no interruption in network performance. The FoE then takes over the duties of the primary Orion server and takes on all responsibilities such as monitoring, reporting and data collection. In addition, the FoE provides e-mail notifications in the event of critical network thresholds being breached, the automation of failover tasks such as updating DNS records and creating processes, and the minimization of WAN traffic. We spoke with one engineer for a state government branch that uses the product who specifically likes how the FoE’s alerting system is laid out, even if the Orion environment were to go down. Other features the engineer discussed as being beneficial include keeping the same IP address of the FoE during a failover and the ability to quickly monitor not only the Orion application, but key server components such as the OS and server services. He also thought that the engine would enhance their current DR strategy, despite the fact that their Orion servers aren’t first priority. You can try out a demo of the product and learn more about the product over at SolarWinds’ site. A quick update on data center news out of the Oracle Open World Conference so far. Sunday night HP execs opened up the event and did a sales pitch for HP’s push into Cisco’s network market, and its converged infrastructure the BladeSystem Matrix. HP also realized that the majority of folks aren’t able to take advantage of its latest and greatest self-service IT machines because their existing application workloads don’t really match up, so it has rallied its professional services arm around the idea of application modernization, so they’ll come in and throw out, replace or rewrite your legacy apps so they can run on a BladeSystem Matrix. Get it? The big announcement of the night was Oracle’s Exalogic, a 30-server box totaling 360 cores, interconnected with Infiniband. It runs with Oracle VM and two guest operating systems, Solaris and Linux. 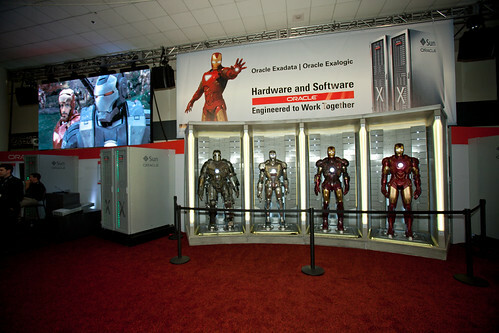 Larry compared Oracle’s latest souped up data center infrastructure (private cloud in a box) to Marvel’s Iron Man. And announced that Oracle would be developing its own version of Linux to run on it with a modernized kernel optimized for Oracle’s software and hardware, Oracle Enterprise Unbreakable Linux. This box is capable of one million HTTP requests per second, and Larry said two Exalogic racks could run all of Facebook. It also phones home when it’s about to break. “We should detect a fault before you do, and start preparing a fix right away,” Ellison said. Sounds kind of creepy. Then, I swear Ellison said “If there’s a problem, yo I’ll solve it.” Check out the hook while my DJ revolves it. Really? Monday morning former HP CEO Mark Hurd took the stage, and seemed no worse for wear following his recent dismissal from HP and the surrounding scandal and fired up the 8am crowd. 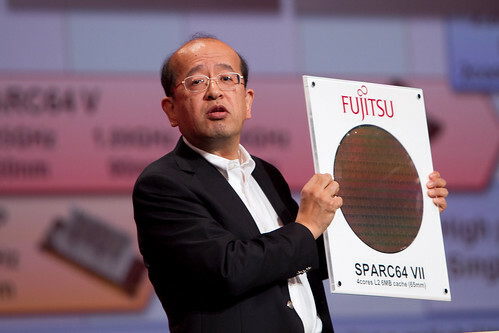 Then Fujitsu’s Noriyuki Toyoki touted the future of SPARC and John Fowler announced a new SPARC T3 chip and offered a timeline for Solaris 11. The first Oracle Solaris 11 Express release, expected by the end of calendar year 2010, will provide customers with timely access to the latest Oracle Solaris 11 Express features with an optional Oracle support agreement. This release is expected to be the path forward for developers, end-users and partners using previous generations of earlier Solaris and OpenSolaris releases. All of Tech Target’s Oracle Open World articles will be posted on this special report page, so bookmark and come back often. Oracle Open World press releases are being posted here. Or you can follow the Oracle Open World Blog. Follow us on Twitter @datacenterTT. PHOTO ATTRIBUTION: Hartmann Studios via Oracle Photos on Flickr. Emerson Network Power yesterday announced its new Knurr DCM Rack server rack platform. The key to this server rack, according to Emerson, is its easy installation of servers and other IT equipment, including Liebert’s line of PDUs and UPS units, an ability to keep up with frequent equipment changes, and a design and base that take up less space and can weather and prevent downtime. Features in the Knurr DCM Rack include a quick-release door with two internal hinges designed for simple access, strength via a door stiffener, an aluminum frame exterior with a T-Slot and a variable mounting system. Continuing with the theme of easy installation Emerson is going for here, optional add-on accessories that are tool-less or require minimal installation include PDU mounting brackets, Liebert environmental sensors, and fixed and telescopic shelves. The server rack is available now through Liebert and other vendors including Dell. It’s offered in 24, 42 and 45U heights, widths of 24”, 28” and 32”, and depths of 40”, 44” and 48”. Can a cloud replace a cluster? Do virtualization and private clouds have the oomph to run demanding research workloads that currently run on high performance Linux clusters? Computer scientists want to find out. Carnegie Mellon University is one of the first users of the Hewlett-Packard CloudStart bundle announced at VMworld 2010 today, which the university will use to provide compute resources across its school of computer science and college of engineering. As the new private cloud comes online, the goal will be to convince users to perform their research on it, rather than on the dozens of compute clusters that already exist across the university, said Dr. Greg Ganger, Jatras professor of electrical and computer engineering and director of Parallel Data Lab. There’s some initial trepidation, Ganger said. “There’s nervousness among some groups about what they’re going to lose performance-wise by running on virtual machines,” he said. And unlike in the corporate world, where CIOs rule with an iron fist, Ganger can’t just order everyone on to the cloud. “We don’t have a stick; what we have is a carrot,” he said. OpenSolaris governing board resigns: Be it Resolved that the OpenSolaris Governing Board hereby collectively and individually resigns, noting that under the terms of the OpenSolaris Charter section 1.3.5 the responsibility to appoint an OGB passes to Oracle. Many folks saw this coming for a while. “Saddened, certainly, but not shocked. The sleigh ride is officially over. As far as the community and governance is concerned, the OGB played right into Oracle’s hand. It might as well have been engineered this way,” wrote Ben Rockwood. Matt Asay tweeted: I think it’s been dead for a long time. We just hadn’t pronounced its eulogy. Oracle simply made the death official. The ray of hope for OpenSolaris users is Illumos, an open source project to develop an OS based on the core OpenSolaris technologies. I recently talked to Jonathan Eunice of Illuminata for a case study I wrote on the HP BladeSystem Matrix. We talked about the benefits and challenges associated with converged infrastructure platforms, aka Infrastructure-by-the pound. Why wouldn’t IT departments build exactly what they need out of commodity components instead of getting locked into a system like this? Jonathan Eunice: For most companies, if they did the world’s best job of selecting, integrating, and configuring the components, their top or bottom line advantage would be? Zippo. They just don’t do enough IT to have a little better assembly of the components than their competition make a market difference. So they’re much better off spending their IT selection, construction, and integration time/effort/money on things that can deliver business benefit–selecting apps, building business logic, etc. It’s much the same reason that most companies that operate fleets of cars or aircraft don’t buy components or kits to assemble themselves. The real business value isn’t in the assembly, for them, so better to contract with a vendor to deliver the infrastructure ready-made, ready-to-use. So completeness, integration, and having someone else responsible are good. And now the trade-off: It makes you more beholding to your vendor(s). Lock-in is an inherent trade-off of ready-made. What’s that saying? Pick your poison? I talked to a BladeSystem Matrix customer and he mentioned the self-service provisioning is making VM sprawl a problem. Can you see this becoming a common issue? How do you keep it reined in? Eunice: IT sprawl is a fact of life. Enterprises’ employees, divisions, and departments want a lot of IT to be accomplished. Tons and tons. VMs make it easier — no waiting weeks or months for new physical servers to be approved, delivered, and installed. Just turn a VM on! Presto! Self-service provisioning is a recipe for even more IT to be deployed. But if you don’t let business functions do self-service, then IT is the bottleneck to the business getting the IT it wants. There are really important trade-offs either way. But they are business and governance trade-offs, more than they are Matrix or infrastructure-by-the-pound trade-offs. Because virtualization and self-provisioning are the technical enablers, they get blamed for what is, in fact, a business policy and governance issue. VM (or IT app) sprawl is a much smaller and more manageable problem within enterprises who’ve tackled things like governance, policies, asset inventory, and change management up front. If deployments get ahead of such procedures for handling IT at scale, sprawl is the typical result. Sprawl = scale without appropriate management and control. Are the Cisco and HP products comparable enough to lump them together as “Converged Infrastructure”? Are IBM and Dell scrambling to keep up with something in this category? Eunice: I think of Cisco UCS as a bit more of a building block, akin to HP BladeSystem or IBM BladeCenter. HP’s BladeSystem Matrix, IBM’s CloudBurst, or Oracle’s Exadata are a bit more fully integrated, wrapped, and packaged as “plug it in, turn it on, go!” solutions (for different kinds of workloads). But that’s a bit of a taxonomic nit. UCS came last to the blade server game, so the way it’s pitched by Cisco or perceived by customers is a lot more colored by infrastructure-by-the-pound and virtualization-everywhere thinking than the foundation HP or IBM blade products. If customers want UCS compared to Matrix etc, I do that. If they want it compared to basic blade servers, I’m happy to do it that way too. So why was HP CEO Mark Hurd really fired? Major news outlets from all over are weighing in on what might have really happened between fired HP CEO Mark Hurd, HP’s board, and former actress Jodie Fisher. The NY Times’ Joe Nocera suspects that HP’s board ousted Hurd because of longtime dislike, and that the sexual harassment charge was a red herring. Nocera interviewed former employees who described Hurd as a cost-cutter who indulged himself, and destroying the “HP way” by chopping R&D significantly. The Wall Street Journal reported that the HP Board actually fired Hurd for circumventing their investigation of the sexual harassment claims by settling with Fisher. Silicon Beat’s Chris O’Brien doesn’t buy either of those explanations, and thinks we’re no closer to knowing what the real reason was. The HP board got rid of Hurd at one of the most dynamic and challenging times in the industry’s history. As a result of all the mergers and acquisitions by HP and others in recent years, the competitive landscape has completely shifted. HP now finds itself in direct competition with Oracle (thanks to the Sun Microsystems deal) and Cisco Systems (now that HP has gotten into networking via its 3Com acquisition) while at the same time the company is taking on IBM even more directly in the services market (thanks to the EDS deal).